WHITE BASS SPAWN - Page 2 - Lake Houston Fishing! Caught a few with big fat egg bellies this past sat in the Bayou above 2100. Went to Caney first for a few hrs with little luck. there was a lot more action up there for the WB a few weeks ago. Still doesn't seem like the right time yet though. But hey, a few slow days is better than a day at work! Txfisherman-2016 I have not heard any reports . if bank fishing you may try the creek in Jessie Jones park. species of fish alive and well. Thanks for the information everybody. I think I will head out this Thursday, and will post report. Last year at one of those parks I ran into a few locals (who fish it all the time) and they gave me some good tips on catching them - lures I never would have thought of trying. I was fishing the same spot as one of these guys and wasn't getting any bites and he was pulling them in left and right. Came back later that afternoon with one of those newfound lures and caught 3 quickly. I grew up fishing for smallmouths in Pennsylvania so the white bass fascinate me. I seem to have a lot more luck with largemouths around here. Agreed on Lake Somerville run - it just seems that certain sections of Yegua Creek get pounded with fishing pressure (day after day after day after day) and a lot are taken out. Fishing from the bank and wading on Caney Creek was slow today. The wind didn't help any. I caught 2 chunky females. Other fisherman I talked too weren't having much luck - a few whites here and there. Several boats made it all the way up to Peach/Caney confluence. There are fish in there but the masses haven't shown up yet - at least where I was fishing. Disappointed I didn't catch or see any other fish (e.g. 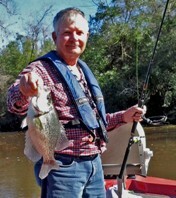 black bass, sunfish, crappie etc). Only saw a few scattered minnows here and there.